The state of the art M4E1 platform starts here, with the M4E1 Upper Receiver. The M4E1 upper receiver is a one-piece design combining the handguard mounting platform with the upper itself. 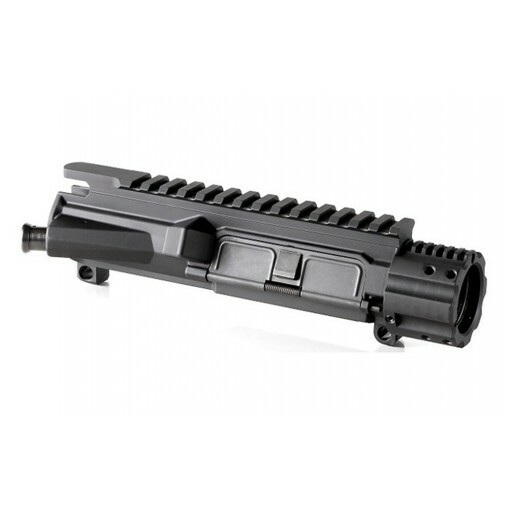 Through superior engineering, we have condensed the parts needed to mount a free-floated handguard to a mere 8 screws. Since the handguard mounting surface and upper are of the same forging, not only is it a stronger system, but we are able to make additional lightening cuts to save weight and allow for more efficient cooling. This was for my first AR build, so I wanted to get an upper receiver that was high quality and had a unique look. I love how the barrel nut is part of the upper receiver. Lining up the gas tube with the upper receiver was one if the easiest parts of the build. Another great feature was the seemless picatinny rail with the Aero Precision floating handguard. There is no gap and you are not missing a picatinny rail between the upper receiver and handguard. I would buy this again from TT because they sell high quality items at a great price and fast free shipping. This was my first build with an Aero Precision receiver. The Enhanced upper is top quality! Everything about it has been thuroghly designed and engineered to be a top performer, regardless of the type of build. This won't disappoint. Planning out my next build and I will definitely be using this upper again. While a bit on the heavy side, these are my favorite upper/rail combo to build with if I am not looking for ultra light. These uppers and their associated rails are fantastic for building 'under rail' suppressor builds (assuming you've spec'd your suppressor to fit under the rails). E.g., an 8" 300BLK barrel and a 9" OAL suppressor fits with just a bit of the suppressor sticking out of the rail (assuming you've used a 15" rail). Supper easy to build, no fuss with aligning your gas tube, easy to swap out rail lengths from a shorty to a longer rail once you get your tax stamp back. Fitted perfectly to my Aero lower purchased at gun show. Barrel went on without a hitch and my AR was complete. Fun, fun.